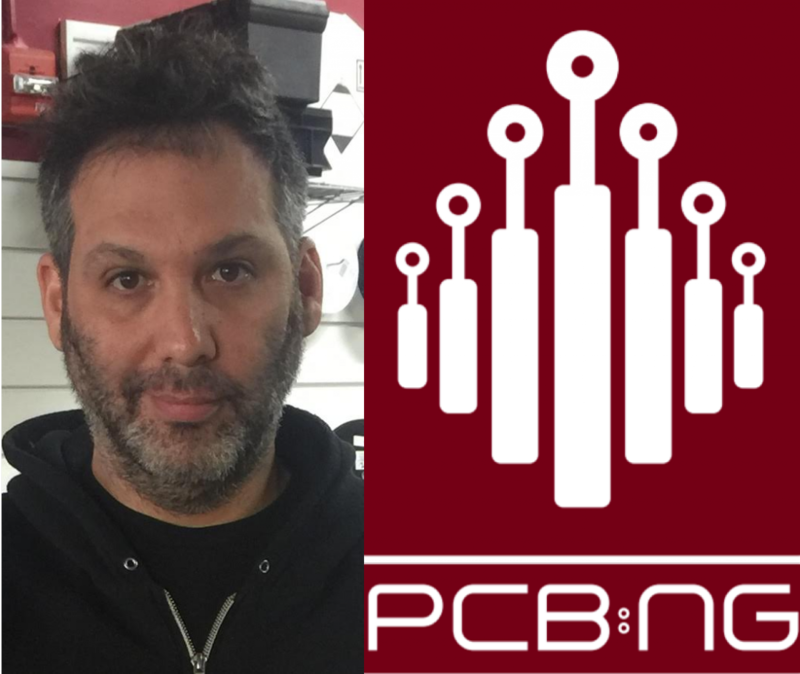 Welcome Jonathan Hirschman of PCB:NG! They are not alone! Refactory (Tom Kennedy) is another assembly house in Brooklyn . PCB:NG will be similar to other on-demand services (with low customer service needs). Sites like Moo/Teespring/Shapeways/Ponoko. There is not much standardization in the industry. There was an attempt using ODB++ and GerberX2. 8 mil drill, 5 mil annular ring. Betas get $1/sq inch in 6 quantity. Other future promos might include incentivizing doing everything in metric. Like other online services, DFM (orientation) needs to be verified in the web interface. “Confounding user tricks” really means dumb mistakes users make (including Chris). It’s never quite “apples to apples” comparisons. Pick and place machines have a wide range of interface software. There are roughly between 20 and 30 vendors. After a user uploads, it gets assgned to panel. Then another algorithm does the Tab routing. The front end updates the database, which delivers files to machine automatically. In the US, assembly amounts for $35B in economic activity. However, most designs are 1-100 quantity. Jon as also the person who brought the Pieco paste press to market. Jon shuttered the company after the support requests became untenable. If you’re interested in trying out PCB:NG beta and want to jump the line, use the signup code “theamphour” or “amp hour” and you’ll get instant access. Hats off to Jonathan on PCB:NG for a very impressive service. All my comments are based on running my own low-volume assembly service. Single sided vs double sided. Since the board goes through the entire process twice, I’ve found that the labor nearly doubles. Also yield goes down for the same reason. What can go on each side ? Anything 1206 or smaller will stay on. So if one side is restricted to that you are good. Having said that, single-side will always cost you less to assemble and yields will be better. Overage. Yes, the big CMs might ask or charge for 100% extra parts. I’ve found 20% is good enough. Pnp error rates; Mis-picks per component type would be nice. There is no substitute for talking to an experienced, objective owner/operator before you buy; That said, many pnps are not used in high-mix/low-volume operations where things like changeover time is critical. Having built a software process around a pick and place machine I can say how pick and place machines store data internally is oftentimes archaic, but at the end of the day, does not matter so much; If you’ve written a whole software front-end already, emitting a format for a particular PNP is or other piece of machinery not that big a deal. Regarding PnP job setup time; I’ve found, 90% of the setup time is loading the parts, so it is directly proportional to BOM size. My process takes about 5..7 minutes per BOM item on average. Remember you have to include the dismount time also. Self-serve model vs. Concierge model. While I started out thinking everyone would accept a one-size-fits-all type of service, I found a very significant percentage just want to do it old-school; Bouncing emails and files back and forth. Some people want total turnkey, Some people even want design services… All this comes through the door.. But you cannot raise your prices overall for high-maintenance customers; Accurate pricing models are a must for everything you offer. That’s true for any business, I suppose.